Film maker Hal Rifken has completed a 30-min. 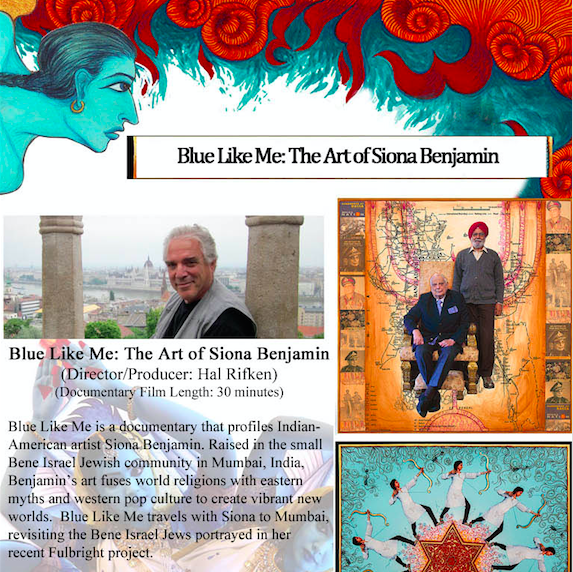 documentary titled Blue Like Me: The Art of Siona Benjamin, which opens at the Indo American Art Council Film Festival in New York on Friday May 8th at 9.30pm. This documentary follows Indian-American artist Siona Benjamin‘s journey back to her roots. Blue Like Me profiles Siona Benjamin, an artist who has a fascinating back story: she was raised in a near mythical 2000 year old Jewish community in India, and though most of the Jews from her childhood, like Siona, are now scattered around the world, some Jews remain and are the subject of her recent work.Other interesting tidbits that influence her art: she studied with Catholic nuns and Zoroastrian teachers, lived amicably among Hindus, Muslims and Christians. These experiences and influences inform a major theme in her art: how can we live peaceably amongst our neighbors who might look and think differently from ourselves? The film will be shown at several other venues, and as a special event on June 30th by the DC Jewish film festival. Contact: Hal Rifken at halrifken@gmail.com or 917-971-8355.